The aim of this study is to investigate the efficacy and safety of sacral neuromodulation for neurogenic lower urinary tract dysfunction. Patients with neurologic disease often suffer from lower urinary tract symptoms (LUTS) and treatment is a challenge because all available therapeutic modalities may fail. 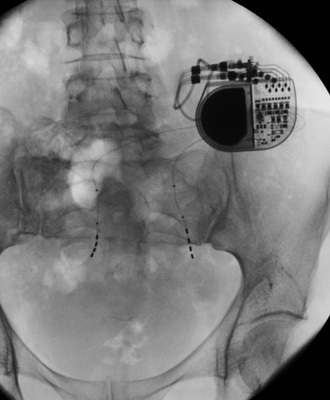 Sacral neuromodulation (SNM) has become a well established and widely accepted treatment for refractory non-neurogenic LUTD, but its value in patients with a neurologic cause is unclear. In a recent systematic review and meta-analysis (Kessler TM et al., Eur Urol 2010), we found that there is evidence indicating that SNM may be effective and safe for the treatment of patients with neurogenic LUTD. However, the number of investigated patients is low and there is a lack of randomized controlled trials. Primary objective: To investigate the efficacy of SNM for neurogenic LUTD to improve key bladder diary variables as compared to placebo stimulation. Secondary objectives: To assess the safety of SNM for neurogenic LUTD, urodynamic parameters and costs. Prospective, randomized, placebo-controlled, double-blind multicenter trial including 4 tertiary SNM referral centers in Switzerland. Patients with refractory neurogenic LUTD are included and randomized after neuromodulator implantation into SNM ON (n=30) or SNM OFF (n=30) for a 2 month double-blind SNM phase. After a 2 month post-implantation phase when the neuromodulator is turned ON to optimize the effectiveness of neuromodulation using sub-sensory threshold stimulation, the patients are randomized in SNM ON or OFF, i.e. during an outpatient visit, neuromodulation parameters are checked and the neuromodulator is turned ON or OFF by an investigator not involved in assessment of the clinical outcomes. Primary: Success of SNM (defined in accordance with the literature as improvement of at least 50% in the key bladder diary variables). Secondary: Adverse events, urodynamic parameters, and costs of SNM. Neurogenic LUTD impairs the lives of millions of people worldwide, it has a major impact on quality of life, and besides the debilitating manifestations for patients, it also imposes substantial economic burden for every health care system. The efficacy of standard treatment of neurgenic LUTD is often unsatisfactory. Thus, it is of utmost importance to know whether the minimally invasive and completely reversible SNM would be a valuable treatment option for patients with neurogenic LUTD. The present study will be the first adequately powered, randomized controlled trial assessing SNM for neurogenic LUTD. This trial will give significant insights into the difficult management of refractory neurogenic LUTD. In the case that SNM is really effective in the neurologic population, this would have major implications for daily practice and would completely revolutionize the management of neurogenic LUTD. In addition, this multidisciplinary trial will significantly influence all involved disciplines, i.e. neuro-urology, urology, and neurology and it will promote future multidisciplinary, multicenter approaches and collaborations further improving patients’ medical care and also strengthening the Swiss position in the ambitious research field of neurourology.